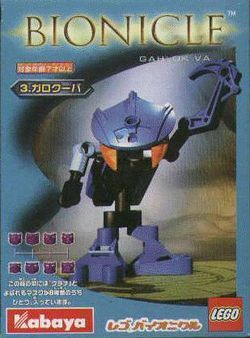 1433 Gahlok Va is a BIONICLE set released in 2003 as a Kabaya Promotion. It is one of the Bohrok Va. It has a Climbing Hook in its left claw and a dormant Krana on its back. Gahlok Va were scouts and couriers for the Bohrok, like the other Bohrok Va. This set was also released in 2002 as 8550 Gahlok Va. Pushing on it's "backpack" will cause it's arms to move. It also carries one of Gali Mata's water hooks. Facts about "1433 Gahlok Va"
This page was last edited on 15 March 2016, at 04:47.